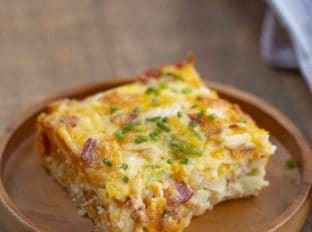 Breakfast Casserole made with eggs, bacon, shredded potatoes, and cheese is the PERFECT make-ahead breakfast for busy mornings or holidays! 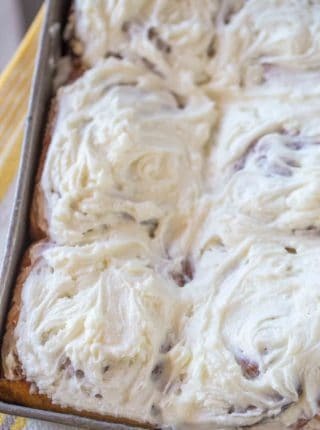 During the holidays we love going overboard for breakfast with delicious breakfast options including Easy Cinnamon Rolls (in 1 Hour! 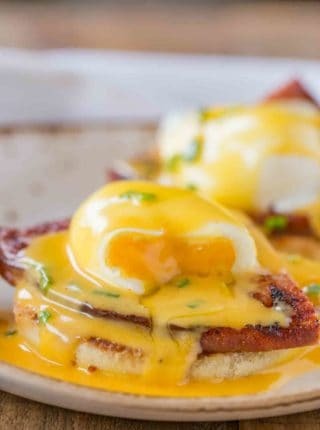 ), Easy French Toast Bake, and Eggs Benedict! Breakfast Casserole is my go-to on the holidays because it’s really EASY and stress free to throw together for breakfast or brunch. Plus you can prep it ahead of time and just pull it out of the refrigerator when you’re ready to bake. I use bacon in my casserole, but you can use any of the usual breakfast meat options like sausage or ham if that’s what you have. I know this is typically a breakfast recipe (or brunch), but I’m not above serving this for dinner on a semi-regular basis. I know it’s crowd-pleasing because my family even requests it weekly! We prefer the texture of the shredded hash browns, but diced hash browns will work, too. If I’m serving this casserole for a crowd, I’ll often make a batch of Buttermilk Biscuits on the side. Eggs and biscuits make the perfect breakfast combo, and it also gives people more variety to choose from at the table. This is a great recipe for making breakfast in the slow cooker, but only use the low setting to avoid overcooking the eggs. Make an overnight breakfast casserole by setting the slow cooker before you go to sleep and waking up to breakfast! Coat the slow cooker bowl lightly with cooking spray or butter (or use a crock pot liner). Sauté bacon (or sausage), onion, and bell peppers until bacon is cooked through. Drain grease and add to slow cooker. Add all other ingredients and stir everything together, with salt and black pepper to taste. Bake for a total time of 7-8 hours on low, until eggs are cooked through. This breakfast recipe is done when the top is golden brown and firm to the touch. If you used frozen hash browns without defrosting, it may take a few more minutes to cook through. Take this out of the oven just as it sets, it will keep cooking as it cools down. You don’t have to worry about the bacon or sausage because we browned it ahead of time. Just make sure the middle of the pan has set. You may feel like it is done if you’re testing the edges of the pan but you need to test the middle of the pan before you pull it out of the oven for good. 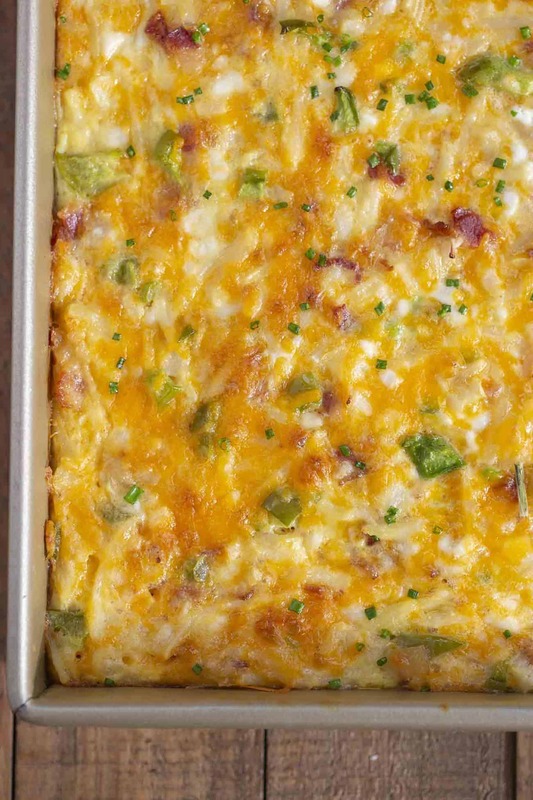 HOW LONG IS BREAKFAST CASSEROLE GOOD FOR IN THE FRIDGE? A fully cooked breakfast casserole will last in the fridge for 3-4 days. If it makes it that long without being eaten. 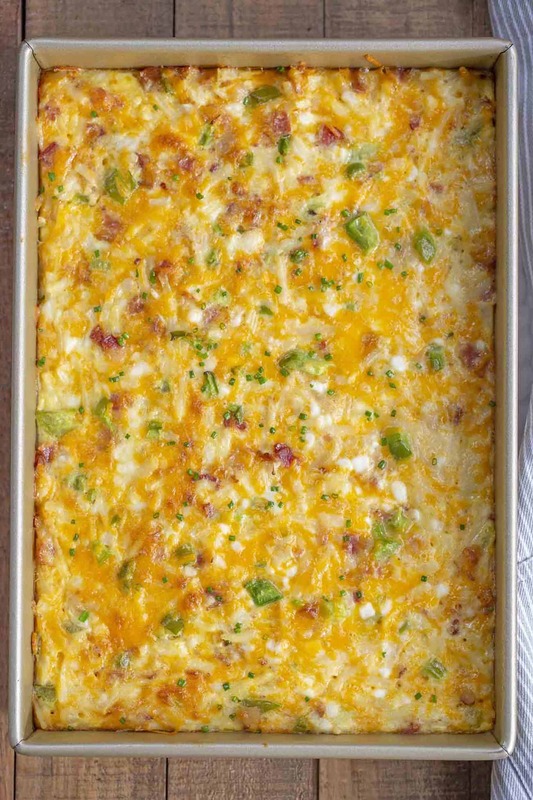 If you prepped this casserole ahead of time without baking, cover and refrigerate it for up to 1 day or overnight, then bake your overnight breakfast casserole the next morning. 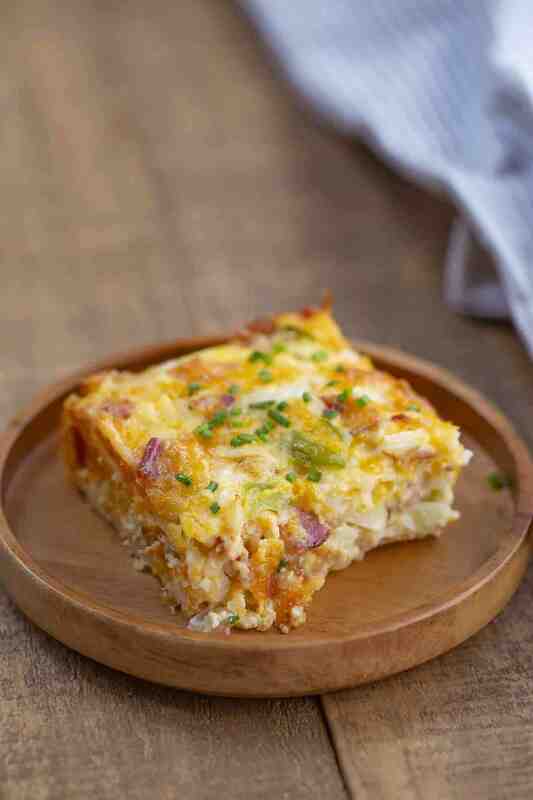 You can freeze this fully cooked easy breakfast casserole for 2-3 months. I recommend using a disposable catering dish if you’re going to do this so you don’t have to use a casserole dish. Make sure you wrap it tightly to prevent freezer burn. You can also portion into serving sizes and wrap each one individually for breakfast or brunch on-the-go throughout the week. Do not freeze this dish if you used an egg substitute as it will not freeze well. You don’t have to cover an egg breakfast casserole while it’s baking. If you start to notice it browning too quickly around the edges, you can cover with tinfoil to prevent burning and check the oven temperature. Then remove the foil for the last 10-15 minutes to get the golden brown color on the top. HOW DO I REHEAT A BREAKFAST CASSEROLE? If you’ve frozen the casserole, defrost in the refrigerator overnight. Then bake at 350 degrees F for 20-25 minutes, or until casserole is heated through. If you reheat a piece in the microwave, the eggs may become overcooked. WHAT ELSE CAN YOU ADD TO BREAKFAST CASSEROLE? Make this a breakfast Tex-Mex casserole by whisking in spices to the egg mixture and adding diced jalapeno or poblano peppers, spicy sausage, and topping with salsa and avocado before serving! Defrost your hash browns or veggies fully before you bake to help prevent the casserole from becoming watery. If you’re making a sausage breakfast casserole, breakfast sausage, sweet Italian sausage, or spicy Italian sausage all work well in this recipe. Depending on the fat, you should still drain any grease from the browned sausage before adding to the casserole. Swap out the cheese for different flavor combos like pepper jack, mozzarella, gruyere, or American cheese. This dish is naturally gluten free, but check any packaged things for added ingredients that vary by brand. Make tater tot breakfast casserole by swapping the hash browns for a layer of tater tots. If you use leftover cooked ham from dinner the night before, you can skip the browning step entirely and make this a one-dish recipe! Preheat the oven to 375 degrees and add the bacon, onion and bell pepper to a large skillet on medium high heat until cooked just shy of being done. 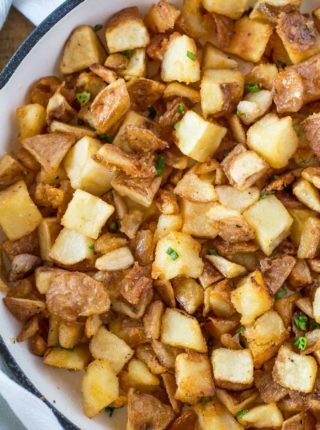 Drain the fat and add the mixture to a large bowl with the hash browns, butter, eggs, cheddar cheese and cottage cheese, mixing the ingredients well. 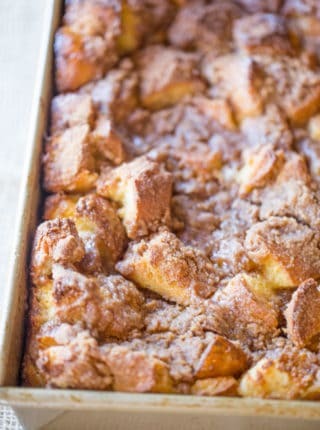 Put into a 9x13 baking dish and bake for 60-70 minutes. My whole family loved this for Christmas breakfast. Thanks for the recipe. What would you suggest in place of cottage cheese? I don’t care for it. I haven’t tested it but you could possibly subustitute with plan yogurt or ricotta cheese. If you decide to try, I’d love to know how it turns out. Thanks! This is the perfect way to cook eggs for a crowd. Love it! Looks so delish! My whole family will surely love this, need to make this! Can’t wait to dig into this on Christmas morning!! Great way to start the celebration! So glad you enjoyed it, Chrissie! My family requests this almost every weekend! It’s so delicious and easy to make!